The above charts provide a long-term perspective for gold. 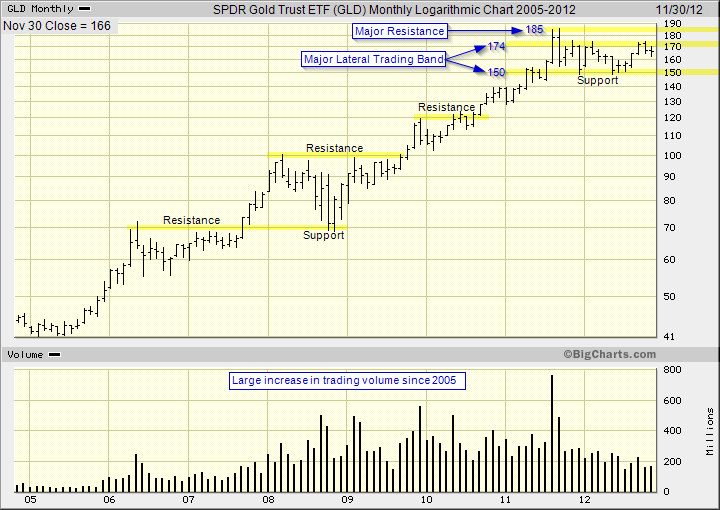 The first chart shows the pricing for SPDR Gold ETF (ticker:GLD) for the period 2005 to 2012 in the logarithmic scale. The second smaller chart extends the date range from 1974 to 2012 and shows the actual price of gold in U.S. dollars in the linear scale. There are two generally accepted principles in technical analysis: (1) individual stocks and broad indexes move in trends, and (2) the trend will continue until there is evidence to the contrary. How is this relevant for gold? The long-term trend for gold is up and is currently trading in a major and intermediate lateral trading band. And the near-term trend is down. Given the assumption that the long-term uptrend will continue for gold, a breakout above resistance of 174 and 185 (ticker:GLD) would confirm the continuation of the long-term uptrend. On the contrary, a break below support of 150 (ticker:GLD) would raise a red flag for the continuation of the uptrend. August, 1971: Then-U.S. President Richard Nixon takes the U.S. dollar off the gold standard, which had been in place with minor modifications since the Bretton Woods Agreement of 1944 fixed the conversion rate for one Troy ounce of gold at $35 (U.S.). March, 1973: Most major countries adopt floating-exchange-rate system. January, 1980: Gold hits record high of $850 an ounce. August, 1999: Gold falls to a low of $251.70. 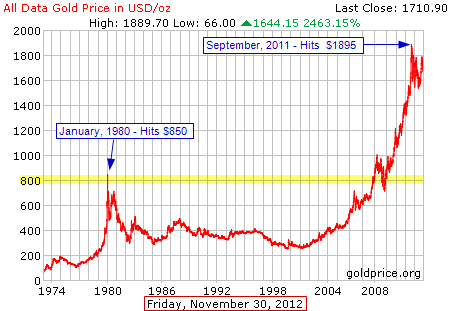 November, 2005: Spot gold breaches $500 for the first time since December 1987. May, 2006: Gold prices peak at $730 an ounce. November, 2007: Spot gold hits a 28-year high of $845.40 an ounce. March, 2008: Benchmark gold contract trades over $1,000 for the first time in U.S. futures market. September, 2008: Spot gold rises by nearly $90 an ounce, a record one-day gain. September, 2010: Gold prices reach $1,300 an ounce. This entry was posted in Stocks and tagged chart analysis, gold, logarithmic chart, resistance, support, trendline on November 30, 2012 by Trader.